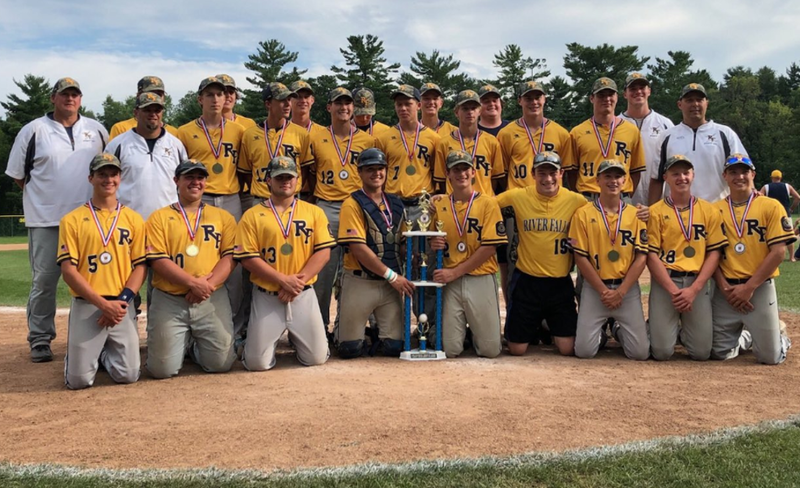 River Falls poses with its Legion Class AA state championship trophy in Baraboo on July 31 (Photo courtesy of River Falls baseball). BARABOO — River Falls Post 121 won the Class AA Legion state championship on Tuesday, defeating New London 3-2 in the title game at Mary Rountree Evans Field. The win gave River Falls its third state title since 2011. Post 121 also won the championship in 2015. Jake Lindsay pitched a complete game on Tuesday to power River Falls to the title, but got a tough battle from the Clippers. New London (23-9) struck for the game's first run when Logan Locy hit an RBI single in the top of the first inning. Joe Stoffel answered for River Falls (20-6) with an RBI double in the bottom of the frame, tying the game at one run apiece. Braden Mork brought him in to score with an RBI single shortly after, putting Post 121 in front 2-1. Locy tallied his second RBI of the game in the third inning to tie the game, but River Falls quickly broke the tie in the bottom half on a sacrifice fly by Mork. It proved to be the winning run. By winning the state title, River Falls clinched a berth to the Division 2 Central Plains Tournament in Wahpeton, North Dakota. River Falls will be joined in Wahpeton by Waupun and Fennimore, the Class A state champion and runner-up, respectively. The national tournament begins on August 9.